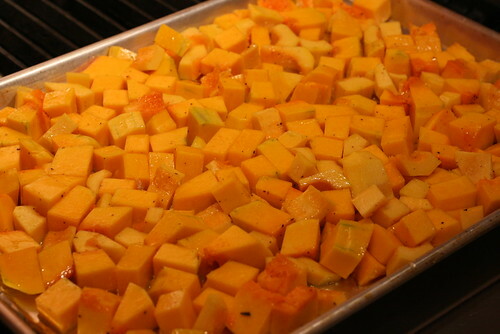 Spread squash on a sheet pan, toss with salt, a few twists of black pepper, and oil. Roast at 350 deg F for 25 minutes; turn once; roast another 10 minutes. Prepare a bouquet garnet (wrap in a cheese cloth) of lemon, ginger, cinnamon, peppercorns, bay leaves, and parsnip leaves. Render bacon, in a large stock pot over low heat. When browned, remove bacon meat, set aside. Sautee onions, carrots, parsnip, garlic, and red pepper until carrots are softened, about 8-10 minutes. Add turmeric, allspice, and cayenne, cook another minute. Deglaze pot with vinegar. Then add chicken stock and honey, stir well. Add bouquet garnet and raise heat to high and bring to a boil. Then reduce to low and simmer for an hour. Turn off heat, remove bouquet, and blend soup (I used stick blender, but traditional is good too). Taste for final seasoning (salt & pepper). 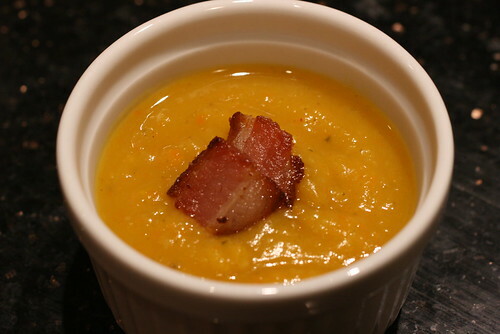 Serve soup piping hot and garnished with reserved bacon. If you were so inclined, you could salt and toast the delicata squash seeds and use those for garnish as well (but I did not). I love the green specks of pasilla and red specks of red pepper. It’s a beautiful, delicious soup. posted by Lon	at 10:08 AM	Filed under Recipes. You can follow any responses to this entry through the RSS 2.0 feed. Both comments and pings are currently closed. I made butternut squash soup last night; I used apples and coriander. But I love the spices in your recipe; I bet they work really well. Looks good–I love the bacon garnish. 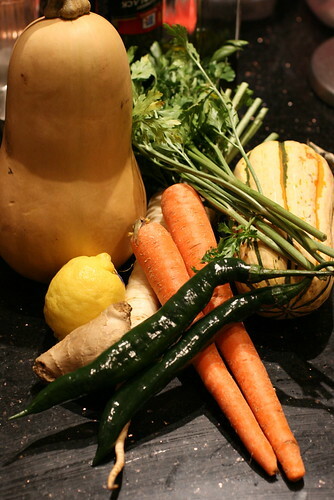 I love squash and making soup with these lovely fall beauties is divine. Can’t wait to try that recipe. Nice crispy bacon on top of that pic. Erik, yum, apples and squash, favorites of this season! Manger la ville, these farmer's market squash are so tempting aren't they? Grace, I know! haha, I said to Jessica as I was writing the post that the ingredient list was a bit ridiculous. However, after your comment I went back to look at one of my all-time best soup/stew recipes: Fusion Chili. It has won many award from various people submitting it to contests as their own. I was thinking it was more complicated, but I realized… it has the exact same number of ingredients (23)! Apparently, 23 is the magic number.